This is a story featuring a member of the NorthStarlight community – Gabrielle, a professional cleaning service provider who has been delivering excellence to her clients for nearly five years. Gabrielle’s clients call her “the magic hand” because no matter how dirty a room or office may be, she always leaves it as clean as new. Do not choose cleaning products that contain large amounts of VOCs (volatile organic compounds). Choose the ones that are VOC-free or have reduced VOCs. More details on VOCs in Commonly Used Products. Do not use cleaning products in a room without good ventilation. Do open the windows or doors to create flow of air. Do not use cleaning products with bare hands. Do wear disposable gloves to avoid direct contact with harmful chemicals. Do not use cleaning products with a protective glove that is punctured or ripped. 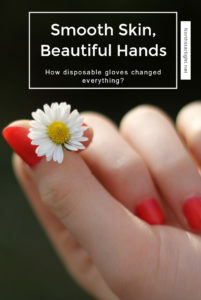 Always check the condition of disposable gloves, and change to a fresh pair as needed, to ensure the best protection. Do not place food in oven, refrigerator, or on countertops immediately after applying cleaning products. Do wipe thoroughly and allow freshly cleaned surfaces to dry completely. Do read product labels and instructions carefully. Oven cleaning products, for example, may require that the oven be heated to a certain temperature following application to eliminate any residual chemicals. Experienced cleaning service professionals know the importance of wearing protective gear such as disposable gloves, face masks, and isolation gowns, depending on their cleaning tasks. Gabrielle is certainly one of them. So how did her hands come to suffer so much? I started using these gloves about a year ago. It really changed my life working for a cleaning service company. My hands are now all healed. These are really good quality gloves. Highly recommend to those who deal with cleaning products. When we followed up with Gabrielle, she was very pleased to share her story. She said she doesn’t want anyone else to suffer as she did. Our hands work hard and need care. At NorthStarlight, we are dedicated to providing superior products to protect hands and make work like Gabrielle’s safer, healthier, and happier day after day.